Accessorize, and Help Support the Zambian Community! This past summer I had the opportunity to travel through Southern Africa with my family. In Zambia, we visited a small community in Lusaka, called Chikumbuso. We were with a group of UW students who were there to discuss the issue of safety in Zambia. The older women of Chikumbuso took this opportunity to share their unique stories with the younger girls. As the women stood shyly in front of the small concrete classroom overflowing with people, they described their turbulent lives. Their stories depicted devastating realities of abuse, AIDS, hunger, poverty, and other impossible situations. I honestly could not help myself from feeling an overwhelming sense of pity. But as they finished their stories, I realized that my pity was out of place among this bold community. Each and every woman was glowing; they were proud of their triumphs over hardships. Their courage sparked my desire to work with these women by bringing their bags to Seattle. The SAAS Zambia trip also got involved, and we were able to collaborate in order to bring this idea to fruition. 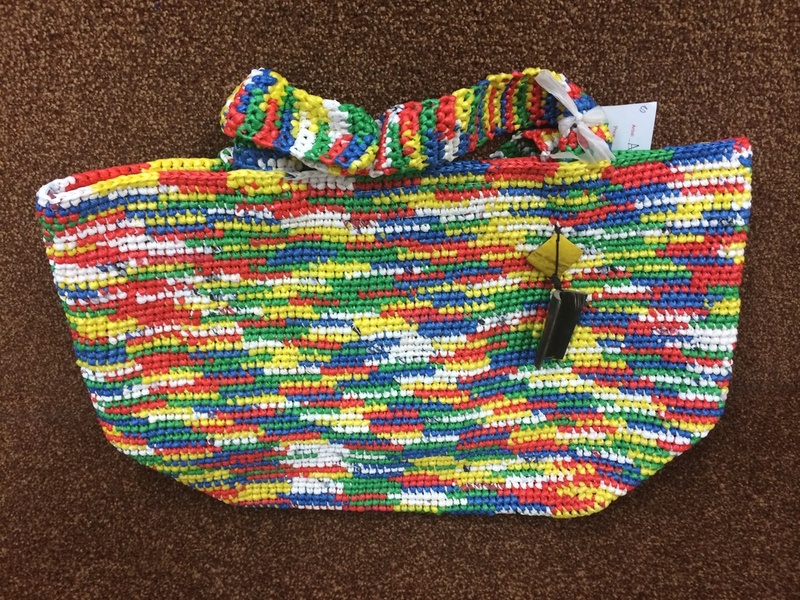 These are hand-knitted totes made from recycled plastic bags. Attached to each bag is the name of the woman who wove it and the date on which she completed it. When a bag is sold, 70% profit goes to the maker; the rest goes back into the cooperative, supporting their school for vulnerable children, an employment training program for young adults, and other programs. Prices range anywhere from $50-$70, depending on size and embellishment. If you are interested in supporting the cause or purchasing a bag, simply email me, Grace Trautman (gracetrautman@seattleacademy.org), or Melinda Mueller (mmueller@seattleacademy.org). To learn more about Chikumbuso, visit http://www.chikumbuso.com/.